We encourage you to visit the farm, get to know our staff, take a lesson or two on our schoolmasters then consider bringing your horses in for training. All levels of horses and riders are considered. Call for more information. WE ALSO SPECIALIZE IN TRAINING RIDING INSTRUCTORS. 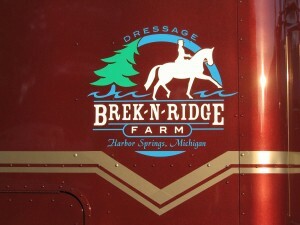 OUR MISSION : Brek-n-Ridge Farm is a training and clinic barn providing a clean, safe, fun and beautiful environment for horses and riders. We are devoted to training horses and riders and providing outside clinicians a Northern Michigan facility so equestrians may learn new techniques and tactics. In between clinics we teach a simple, understandable system of riding to our students that is easy for both riders and horses to understand. During the seasons we mentor one or two students so they may grow as riders and people. Students can apply to become part of our program. We are a small private stable and space is very limited. Finally, we’d like to share with all of you, is that the stable can be a wonderful leadership school. In our society, women and men are not always encouraged to participate, speak out or be in charge. In the barn these qualities are practiced on a daily basis, perfectly matched with an educated compassion for the horses. There is no coincidence that many of the great business leaders in the world have an equestrian background.